September 7th is noted in the Martyrology as the feast day of St Clodoaldus, whose name in English is “Cloud”, and usually pronounced by English-speakers as it is written, as in “raincloud.” It is written the same in French, but the D is silent; by a pun with the word “clou”, he is honored as the Patron Saint of nail-makers. His feast is traditionally included in the supplement of missals and breviaries printed for use in the United States, since he is also the Patron Saint of the Diocese of St Cloud, Minnesota. The city’s name was chosen by a man of Huguenot ancestry, not in honor of the Saint, but from the name of the Parisian suburb where Napoleon had his favorite palace. 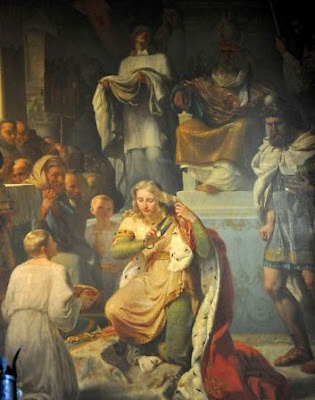 Clodoaldus was the youngest of three boys born to Clodomir, the second son of Clovis, King of the Franks, whose baptism heralded the general conversion of his people to Christianity. After the death of their father, the three boys were raised by their grandmother Clotilda, who is also a Saint. (The family’s penchant for names beginning in “Clo-” makes them rather hard to keep track of.) In the midst of the very complicated, and absolutely horrifying, dynastic struggles of the Merovingian kings, the two older brothers were murdered by their uncle Clotaire. Clodoaldus escaped to Provence, where he became a hermit, renouncing any idea of reclaiming the royal title and dignity that were rightfully his. This was hardly typical of either the era or the family, and the Parisian Breviary of 1847 makes note it by saying that he “was not spurned by the world, as much as he spurned it.” After some time, he returned to Paris and set himself under the rule of a holy monk called Severinus; the place where he established his hermitage was later named for him, the future site of the aforementioned suburb. He was ordained a priest, and spent the rest of his short life in the religious instruction of the people, dying at the age of 36 ca. 560 A.D. The Parisian Breviary also notes that his relics were saved from the profanations that took place during the Revolution, and later exposed once again for the veneration of the faithful. Fr Alban Butler was an alumnus of the English College in Douai, France, and began working on his famous Lives of the Saints while serving there as a professor; he was later appointed to the English College at St Omer. Since these institutions in northern France were so important to English Catholicism in penal times, he understandably devotes a good deal of space to French Saints. The original version of his work contained a lot of material in the way of moral exhortation based on the Saints’ lives, material which Fr Herbert Thurston, S.J., and Donald Attwater removed almost completely when they revised it in the 20th century. One of the very few such passages which they retained was part of Butler’s entry for St Cloud, a quotation which he took from the 15th-century Italian humanist and scholar Pico della Mirandola. The wisdom of these words seems to me especially important today, when politics seems to have gained the power to spread into and poison everything. “Many think it a man’s greatest happiness in this life to enjoy dignity and power and to live amid the riches and splendour of a court. Of these you know I have had a share; and I can assure you I could never find in my soul true satisfaction in anything but retreat and contemplation. I am persuaded that the Caesars, if they could speak from their sepulchres, would declare Pico more happy in his solitude than they were in the government of the world; and if the dead could return, they would choose the pangs of a second death rather than risk their salvation again in public offices.” Amen.